Join the discussion on our forums! 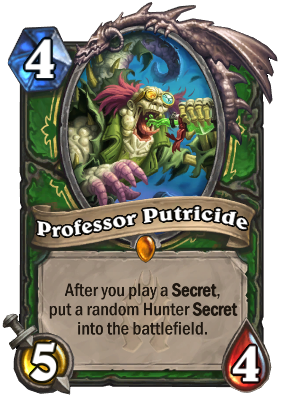 Come discuss Professor Putricide over in our dedicated Professor Putricide discussion topic. This guy has served me well, and getting a second copy of him with Stitched Tracker helps with baiting out removal and increasing his staying power. But I find that he's most effective to solidify your lead when you're ahead on board. Even if the opponent wipes your board he'll make sure you have some sort of defense left. Use him for support so you can pressure an opponent trying to fight back. Wouldn't surprise me if he actually made Subject 9 since they work so well together. A niche pick in Secret Hunter that you'll play with a secret (maybe even two) during mid to late game. Subject 9 definitely helps because previous iterations couldn't really guarantee you to have him with a secret in hand. His stats are good at the cost. I always thought that his ability could just be a bonus. Unfortunately, whenever I've played him, he's always under-performed. A random Hunter Secret just isn't that useful at the stage of the game where it would trigger. new expansion, I have this guy, what do i do? insta dust ? If only it said just " random Secret" instead of "random Hunter Secret." Then that really would have been mad science. Y'know, I thought about some sort of weird secret-pirate hybrid deck with this. The I read the flavor text and immediately dropped the idea of working with such a vile card. Next expansion, Professor Wernstrom, 5 mana 4/6, destroy all enemy secrets, hopes and dreams. Now we know why fidget spiners are taking over the world. FROM MY POINT OF VIEW THE JEDI ARE EVIL! THEY DESTROYED THE GOVERNMENT! THEY SENT THE GALAXY INTO CHAOS!